Over the past year, when reading certain books, I’ve felt as though I am missing something. The feeling first started when I read Donna Tartt’s The Secret History a few years ago, but I always assumed that I was just too young to fully understand the book. But more recently, when reading Ali Smith’s Girl Meets Boy, The Magus by John Fowles and many other novels which hint at or are inspired by Greek mythology, I have felt completely out of my depth. References that other people seem to fully understand fly right over my head. I don’t remember learning much about Greek mythology when I was at school, which I find quite shocking seeing as it plays such a vital role in our culture – especially art and literature; two subjects I have an interest in. Wanting to catch up, I immediately researched and decided to buy a well-respected translation of Ovid’s Metamorphosis. Although Roger Lancelyn Green’s Tales of the Greek Heroes is about the Greek heroes rather than the Gods, the Immortals do play a huge part, and we get the basic outline of some of their stories, including the very beginning. Sitting in Waterstones for about an hour, skimming through the various different retellings and informative guides of Greek mythology, Roger Lancelyn Green’s book stood out. As well as a beautiful cover, there is also a brilliant introduction from Rick Riordan, the man behind the children’s series Percy Jackson, and that’s what really persuaded me to choose this particular book. I was happy with my choice because it is a nice, brief outline of some of the main stories, lots of which I recognised. It was a quick and easy read, with a simple explanation of the legends and a clear and concise introduction to the main Gods and heroes. It has even made me want to search out more children’s versions with more detailed stories of particular heroes and Gods. For example, I would love to read a swashbuckling tale of Jason and the Argonauts or a more in-depth version of the twelve labours of Heracles. I look forward to reading more about Troy and would love to get to know the good Titan Prometheus much better. Another point to add is that Roger Lancelyn Green’s book is great for kids. There’s lots of gore, terrible monsters and clever plots, as well as being a brilliant introduction to Greek mythology. It’s definitely something that I’d have benefited from reading when I was younger. Also, the handy glossary of the different names of the Gods and Goddess of Ancient Greece at the back is probably going to be very useful in the future, to keep my mind from getting tangled! After reading Tales of the Greek Heroes, I have also started to crave a holiday to Greece. The descriptions of Greece in the first chapter make it sound like some sort of heaven on earth and I’m sure knowing the famous legends and myths would make it a very interesting place to visit. I think I still have a long way to go before I feel utterly confident to read Ovid’s Metamorphosis, but I’m sure I’ll really enjoy every minute of getting to the right level! Want to buy this for yourself or as a present for a child? Click on the picture below! 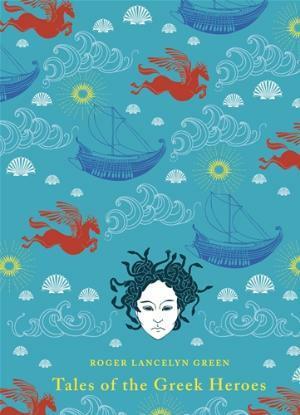 I felt (and still feel) all at sea with Greek/Roman mythology (Ovid is Roman remember). The Illiad and the Odyssey are great reads and I recommend the Richmond Lattimore translations if you can get them. Likewise Virgil’s Aeneid is great and introduces you to the great Dido and Aeneas business. For a slightly different classical read Marguerite Yourcenar’s Memoirs of Hadrian is stunning. Robert Graves also wrote a lot on myth, including several introductions. Thank you for the recommendations! I really want to read more about Greek (and Roman) mythology and get to a stage where I feel confident about who everyone is! A lot of the translations do look very daunting though! That’s why it’s so good to learn from other people the best books to go for! This is on my wishlisht already but I might have to bump it up – I didn’t know the UK cover was so pretty! If you’re looking for something to help you get the references in other works though it might be worth investing in a cheap dictionary or encyclopedia of of Greek mythology (I seem to recieve several each year for christmas/birthdays so I’m assuming they’re not too expensive anyway). It doesn’t beat reading a proper retelling at all but sometimes references are pretty obscure (several versions of the same myth) or not always to be found in the kiddy friendly books – though they’re a great start to getting into the mythology itself. I’ve not read Ovid or the Argonautica (yet) myself, but neither Homer (if you get a good translation) nor a lot of the surviving Greek tragedies are very difficult reads if you did want to go back to classical sources (though even the plays are mainly just retellings and sometimes quite bizarre ones too). I think that’s a good idea! I will keep my eyes peeled at the charity bookshop where I work to see if any dictionaries of encyclopedias turn up. I’ve already been looking out for decent translations of Homer but so far no luck 😦 I may have to resort to Amazon soon! This is going on my wishlist! Thanks for posting it… 😀 I’ve just read an easy German version of the Nibelungenlied legends (Siegfried, Kriemhild etc) as I felt I was missing out so much! Now I feel enlightened! Sometimes it’s good to go back to the basics. I’m sure it helps a great deal to enjoy other books! I love Greek myths too but I have only read the stories adapted for younger readers -it would be good to find a detailed and accessible book on Greek myths for adults! I’m excited about Madeline Miller’s The Song of Achilles which won the Orange prize simply because it’s connected to the Greek myths a little bit! I know! When I attempt to read the more challenging stuff straight away it just puts me off! Gradually I’ll get there with kid’s books. I’ve been meaning to put Madeline Miller’s book on my reading list too!